File photo of order forcing thousands of Japanese people into internment camps during WWII. A panel of speakers will assemble in Richmond on Sunday to discuss the impact of President Franklin Roosevelt’s executive order that forced the imprisonment of more than 100,000 Japanese Americans during World War II. The day of remembrance takes place on the 75th anniversary of Executive Order 9066, signed in 1942. Flora Ninomiya, who as a child was required to move from her East Bay home to a work camp in Utah, will lead the event starting 2 p.m. at the Rosie The Riviter World War II Home Front. The roster of speakers also includes people who resisted the executive order, such neighbors who went to extreme lengths to protect the assets of their Japanese-American friends. Lina Aebi Hale is scheduled to discuss her experiences at the Aebi plant nursery, where her father Frances Aebi secretly managed several nurseries for Japanese Americans who were interned. Edward Downer III will follow and discuss his father’s tenure as the President of Mechanics Bank in Richmond, where he kept safe the mortgages belonging to Japanese families. Secret efforts like those made it possible for some Japanese-Americans to return to their homes and work in the Bay Area. Thousands of other imprisoned families were forced to relinquish property rights and suffered physically, emotionally and financially years after the camps shuttered. A screening of documentary “Blossoms and Thorns,” about the order's impact in the Bay Area, will follow the panel. City and county leaders are also paying tribute to the anniversary this week. 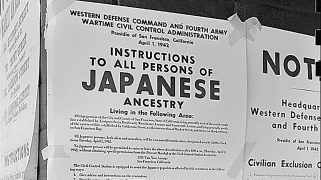 On Tuesday, the Contra Costa County Board of Supervisors approved a proclamation recognizing the significance of the 75th anniversary and issued a formal apology to Japanese-Americans who were affected. Supervisor John Gioia, whose district encompasses Richmond, compared Roosevelt’s order to Trump’s travel ban that blocked people from majority-Muslim countries from coming to the U.S.